You must make reservations at least 5 minutes in advance of the time at Townsend. A contemporary French restaurant in Philadelphia. Located in a renovated East Passyunk row home, Chef Townsend Wentz's elegant French menu follows the seasons. Our wine selections are carefully cultivated, constantly searching for honest wines made by caring producers. Escargot and Brussels Sprout "Mange Tout"
The meal was outstanding. It was more outstanding than the last time I was there! This is our third or fourth time having a full dinner at Townsend. We have also had rinks and small plates at the bar too many times to count. And while we have always liked and appreciated the cuisine here, we have never been completely bowled-over. Well, tonight we were - all four of us - bowled-over. What an elegant and delicious dinner. The halibut was superb - just superb. The lamb-three-ways was amazing according to our Northern California friend. The Sauteed sweetbreads/bone marrow was as good as it gets. 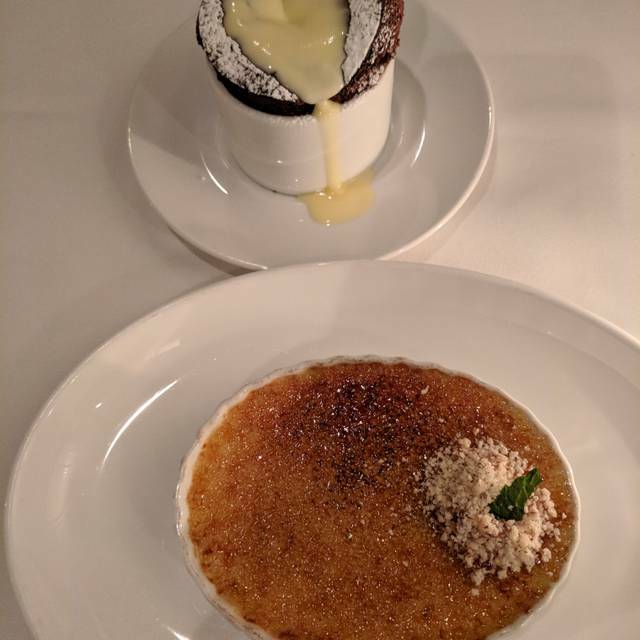 And the desserts from the chocolate souffle to the amazing creme brulee........well, what a fantastic experience!! Drinks were great,food was less than lackluster. The drinks and food were so delicious. I absolutely want to go back. The customer service was fantastic. I highly recommend. Run don't walk. Delicious with a great wine list. Very good French restaurant. We had the Degustation menu of five courses that were outstanding, perhaps, as ist is "normal" in the USA, the single courses were a bit large. Very good Quality, good wines available by the glass. Parking space is a problem and explains perhaps why there were not so many guests; we were lucky to find an empty parking spot right in front of the restaurant. 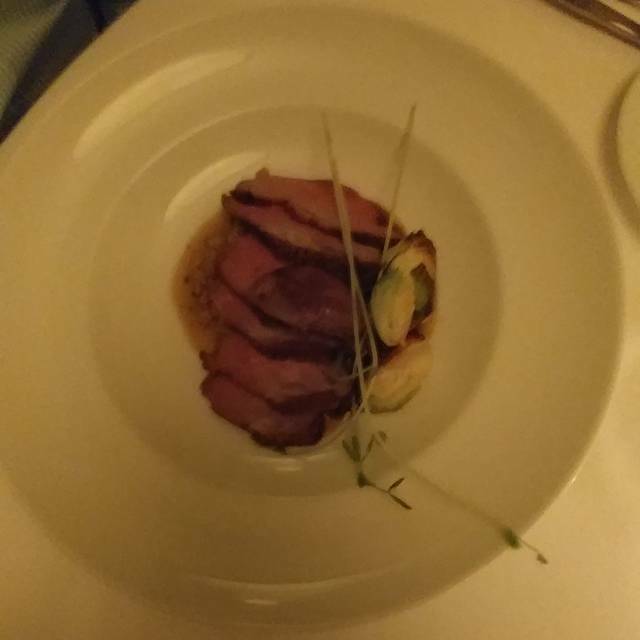 This is a bit of a "special occasion" spot (unless you're wealthy, I suppose), but for the amazing food and service I'd have expected to pay much more. Staff was incredibly knowledgeable, the cocktail menu was wizardry, and the halibut was something truly special. Basically quite good however it proved to be more expensive than one would have expected it to be. Fabulous meal, wonderful server, first rate experience. What an amazing meal. We ordered almost everything on the menu and it was all delicious. The waiter was knowledgeable about the menu and answered all questions we had. He also knew his wines which I find to be rare that the waiter knew both the food and wine menus. He was pleasant and funny, he joked about the fact that two people could eat the entire menu. It’s small and quaint but they don’t shove tables together so close that you’re talking to your neighbor. We will be back for more of everything. Thank you Townsend for a wonderful night out. Beautiful Old style foods in New ways. Loved how the flavors all worked so well together for everything. My wife and I settled on the 5 corse tasting menu. From beginning to end, the entire experience was just fantastic. The courses for this evening included the Lobster Salad, Black Bass, Pork Belly, Filet Mignon and Short Rob with a Dessert. Let’s just say fabulous. If I had more time, I would write about each dish and the service we received from Stephen. It was our first visit and we can’t wait to go back. As an ovo/lacto vegetarian who allows for the occasional pescatarian exception, I was a little worried about requesting a modification of one course to remove the pork from a lobster/pork dish, for fear that it might be uncouth at best, or offend the chef’s vision at worst. However, despite the usually fauna-dense carte du jour of French cuisine being enough to keep vegetarians at bay, I was willing to show my interest respectfully at the risk of the aforementioned. Needless to say, our server was already prepared to suggest the adjustment as if he had been reading my mind. Absolutely wonderful! Everything from the aperitif to the desert cheese plate was brilliant! Art for the tastebuds. Amazing, knowledgeable and attentive staff, and the quaint atmosphere was just perfect. Loved the fact that tables are not to close to one another. Appetizers were very good. Main course a little disappointing. I had the halibut. It lacked a bit in flavors, a bit dry. My husband had the lamb, it was just ok. Desert was fabulous though. Dinner at Townsend was truly delicious. We shared many different things and all of them were wonderful! Great flavor and balance on the palate! Service great! Wine bottle excellent. Lobster/pork course so so. First course - Lobster tough and I didn’t ask questions and pork was in ground burger form. Halibut entree delicious and creme brûlée dessert wonderful! Had a fun evening, but a bit disappointed after Craig LeBan’s review. Terrific food and service. The various courses were served at a comfortable pace and you can carry on a conversation without needing to shout. This was the second time that I dined at Townsend and it was just as lovely this month as it was last year. I've now had the chance to try both the Chef's Tasting Menu and ordering a la carte from the menu. Both were delicious. Standouts included Duck Fat Confit Finger Potatoes as a first course and Lamb Loin ‘en Crépinette’ as a main course. Our server was extremely professional and helpful. 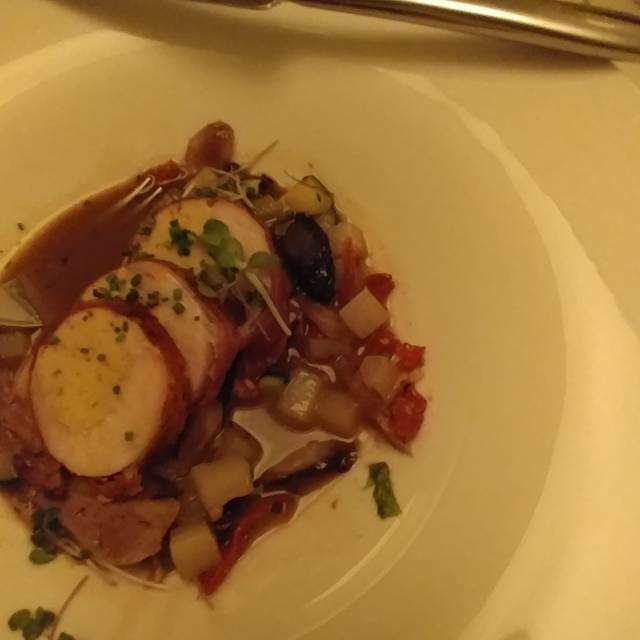 We thoroughly enjoyed the East Passyunk Restaurant Week menu at Townsend. The 3 course wine pairings for $25 was a good deal as well. The service was exceptional. The food was delicious. We ordered the chicken and beef entrees. They were both wonderful. Highly recommend Townsend! It is a true gem! My first meal at Townsend was absolutely dreamy good. The food... amazing! The staff were lovely, very friendly and attentive. The ambience had a very homey feel...loved the fireplace. One of the best meals I've ever had. Already planning to return soon! Great for a special occasion or when you're feeling like a fancy night out. The service was terrific. recommend the foie gras and striped bass, will definitely be back. We visited Townsend on March 5, 2019. Everything was great, especially our server, Steve, who provided accurate information about the food and wine. This has become one of our favorite restaurants. Townsend is one of our favorite restaurants. We love sitting at the bar talking to their intelligent, friendly bartenders, eating some of the best food in the city. This is one of our favorite restaurants in town. It is fine dining with a relaxed feeling and the staff is always great. We had an amazing dinner. Everything we enjoyed was spectacular! Our waiter was amazing and so was the food. Everything top shelf. Pricey for the area but worth it! Portions were a little small and the tables are very close (as you’d expect with a boutique CC restaurant). Otherwise it was great. The service was perfect. The food was amazing. I’d strongly recommend this place and I’ll certainly be going back again. First timer, and the only thing I was disappointed in was the fact that it was E. Passyunk's restaurant week, so our options were somewhat limited. You could still get regular menu items, but they didn't offer the standard chef's tasting menu. Nonetheless, the food was phenomenal, quaint little spot, great service. I'll definitely be going back. It was Restaurant Week so the restaurant seemed more crowded than usual. Is it possible that they added some tables? Anyway it spoiled our birthday meal. The food was excellent as always. Fantastic food, great service. Will definitely be back! We came for restaurant week and will. Definitely be back! Loved the whole experience!